By Leila Al Shami. First posted at Leila’s Blog. The town of Zabadani lies some 50 kilometers from Damascus, close to the Lebanese border in south-western Syria. Nestled between green mountains, it was once a popular tourist resort for Damascenes escaping the capital’s stifling summer heat. In 2011 Zabadani became a centre of resistance to Assadist fascism. Today the town is being pulverized and its people driven from their homes. The first anti-regime protest was held in the town on 25 March 2011. A diverse revolutionary movement kept protests and civil disobedience alive and the town’s women overcame traditional social barriers to play a central role. They took to the streets despite the mass arrest campaigns and the security forces’ live fire. In January 2012, Zabadani was liberated by the Free Army. As the state retreated the town’s people came together to keep their community functioning and to try alternatives to decades-long dictatorship. Martyred anarchist Omar Aziz was involved in setting up the local council. Its members were elected with wide popular participation including by Christian residents of the Sunni-majority town. Young revolutionaries produced a weekly magazine, ‘Oxygen’, dedicated to peaceful resistance and providing analysis of the revolution. A photography collective called Lens Young Zabadani was set up to document daily life. 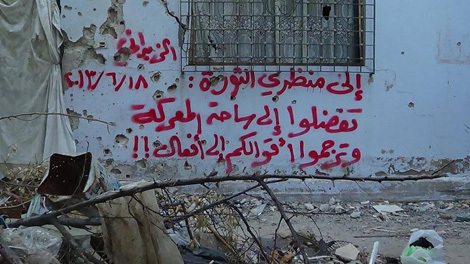 Zabadani’s people have lived freedom, but this has come at a huge cost. In a pattern played out across the liberated areas, the regime subjected the town to a siege which by May 2013 had turned into a full blockade accompanied by daily bombing. Since 3 July the situation has dramatically worsened as a result of a regime offensive supported by masses of fighters from the Iranian-backed Hizbullah. On 30 July Zabadani Council issued an urgent appeal. It stated that 48,000 residents had fled Zabadani to the nearby towns of Madaya and Bloudan. “The displacement of the people of Zabadani to Madaya means that they will be confined to a narrow and very densely populated geographic area already populated by a large number of displaced civilians and will be again besieged in an area which is being continuously targeted with barrel bombs by Assad’s warplanes and with heavy artillery bombardment by regime ground forces. The area is also surrounded by regime checkpoints where regime troops are already hunting civilians (men, women and children) from Zabadani, as well as warning them to prepare for a massacre and long-term siege.” It continues: “These threats against the people of Zabadani are the start of the regime’s and its accomplices’ planned ‘demographic change’ which we have warned repeatedly of. This threat to the people is not limited to Sunni Muslims but also includes the town’s Christian and other population, with all the town’s people being driven out in order to ‘cleanse’ the area and prepare for it to be resettled by foreign occupiers.” There are further recent reports that civilians displaced to two neighbouring towns, Bloudan and Al Mamoura, are being forced to leave. They have not been allowed to take their belongings, and many have been taken by military vehicles to Madaya. The plan to cleanse Zabadani of its inhabitants came to the fore during recent cease-fire negotiations held between the Islamist militia Ahrar Al Sham, now the dominant armed rebel group defending the town, and an Iranian delegation, yet one more sign that it is now Iran, not Assad, which is calling the shots in Syria. The negotiations were premised on ending regime attacks on Zabadani in exchange for the end of Ahrar Al Sham’s campaign on the two Shia/regime loyalist towns of Al Fawaa and Kefraya in Idlib province. Yet negotiations broke down when Iran demanded demographic changes, calling for the removal of civilians from Zabadani in exchange for relocating the residents of Al Fawaa and Kefraya to Damascus. Cleansing opposition areas of their Sunni inhabitants is not new. Following a cease-fire agreement in Homs, civilians were evacuated through ‘safe’ corridors. Many were detained by the regime and never seen again, the Homs Land Registry was destroyed and mainly Alawite regime loyalists were moved into now vacant Sunni houses. Perhaps the scenario is closer still to that of Qusayr, another predominantly Sunni and strategically important town near the Lebanese border surrounded by Shia villages, which links the capital with the regime’s stronghold on the coast and is an important supply route to Homs and from Lebanon’s Bekka Valley. Liberated Qusayr fell to the regime in 2013 following a fierce attack by forces including thousands of Shia fighters from Hizbullah. A Lebanese-negotiated agreement between rebels and Hizbullah saw the evacuation of rebel fighters from Qusayr, as well as civilians, with reports of homes in nearby evacuated villages being looted and burnt to prevent residents returning. Qusayr was the first battle in which Hizbullah played a lead combat role. This pro-regime intervention by foreign Shia Islamists led to a deepening of sectarian tensions. A few days later there was a savagely sectarian response at Hatla in Deir al-Zour, where 60 Shia – some shabiha but at least 30 civilians- were killed. Zabadani is the last remaining rebel stronghold in the Qalamoun mountains. It is of strategic importance to the resistance around Damascus for its supply lines from Lebanon, and it is also of strategic importance to the regime, Hizbullah and Iran. Yet beyond immediate military value, forced population transfers give rise to the fear that there’s a plan to divide Syria on sectarian lines, to redraw the borders with Alawites and Shia, Sunnis and Kurds all taking their own sections of the country. Far from being a prelude to peace, such a plan would precipitate an ethnic cleansing on a scale not yet seen in the country. Syria’s diverse ethnic and religious groups do not fit neatly into geographical areas and are spread across all regions. Even in the coastal region, the regime’s Alawite stronghold and presumably a key part of any future Assadist state, the two main cities – Lattakia and Tartous- contain major Sunni populations. Zabadani’s people once took to the streets chanting the anti-sectarian revolutionary slogan “The Syrian People are One”. Now they are being expelled from their homes for the sake of what looks like an Iranian-sectarian partition.